Watching VFX breakdowns is always enchanting. 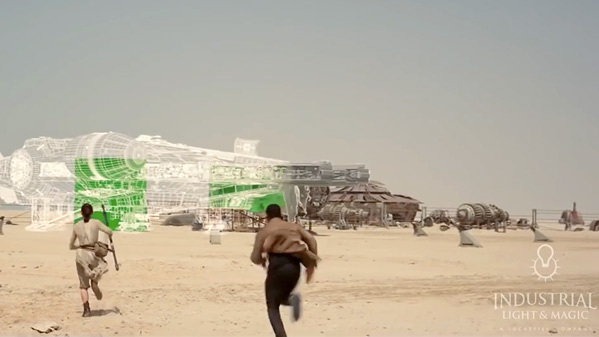 ILM has released their full 4-minute video showing their work on Star Wars: The Force Awakens. "The history of ILM leads all the way back to 1975 and origins of Star Wars and The Force Awakens gave us the opportunity to once again push the boundaries of what is possible in character animation and visual effects while combining cutting edge practical effects and physical sets." It's always cool to get a glimpse of what it was like on set and how much they added in each scene to make it feel so real. The amount of objects and layers in some of the scenes is remarkable. ILM also work with their "partners Hybride, Base FX and Virtuos" on this project. All movie geeks need to watch this. For even more updates on Star Wars, follow @starwars or @ILMVFX. Visit our Star Wars News page here. Star Wars: Episode VII - The Force Awakens, continuing the beloved original trilogy about Luke, Leia, Han & Chewie that ended in 1983, is directed by J.J. Abrams, of the films Mission: Impossible 3, Star Trek, Super 8 and Star Trek Into Darkness. The screenplay is written by Lawrence Kasdan (Empire Strikes Back, Raiders of the Lost Ark, Return of the Jedi, The Big Chill, The Bodyguard) and J.J. Abrams, with Kathleen Kennedy from Lucasfilm producing. This debut is the beginning of a brand new saga, with another trilogy planned for this storyline, with Rian Johnson and Colin Trevorrow lined up to direct. Disney, after acquiring Lucasfilm in 2012, released Star Wars: The Force Awakens in theaters everywhere December 18th, 2015. I've been very critical of The Force Awakens because of both the plot and the art direction. But one thing I can't knock is the CG when judged out of context. I might not like what the CG was used to create but it did look very impressive in terms of photo-realism and detail. Agreed. Same boat. I did not like TFA at all. But the effects were indeed flawless. The force awakens worked as a laxative to help us dump out the prequels down the drain of bad memories. And this alone is a great accomplishment. I actually liked the prequels more than The Force Awakens. They had some serious flaws as well but they felt more like they were a part of the same universe as the Original Trilogy and their scope was absolutely epic. The Force Awakens somehow managed to make the Star Wars universe seem small. On the contrary. The prequels was an abomination. Everything looked fake and videogamish. I couldn't connect with any character. The only intereting character was Darth Maul. But he was killed off too fast. When I watch the prequels, I have the feeling to watch sesame street with light sabers. Lucas was aiming a very young audience with the prequels. Only those who were very young the time TPM was released, can find redeemable things in the prequels. The tangible quality to working at ILM must make it one of the most rewarding jobs in the history of jobs.